We have found so many treasures that we have been meaning to share with you. This week, we have big plans to update our little shop and share the love. 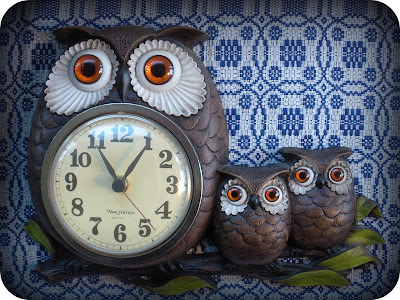 Today we put this Hootie Hoot Hoot Owl Wall Clock in the shop. The Hootie Hoot Hoot Wall Clock SOLD. Woo! Hoo! Bummer! I was thinking of snagging it. My grandmother had that EXACT clock on her wall. Oh well. Even seeing the picture made me happy. Maybe I'll find another one for you, YOU never know. I'll be on the look out. What a cutie. Not surprised it sold. I needed it so badly. It reminds me of something my gran had hanging on her wall. I hope someday I'll have a kid so I can decorate the room in a woodland them and have the clock on the wall. I love it. I haven't checked in for awhile. I always love reading your blog. Miss you guys! !